This is the final part of my Peter Pilotto haul from Target. 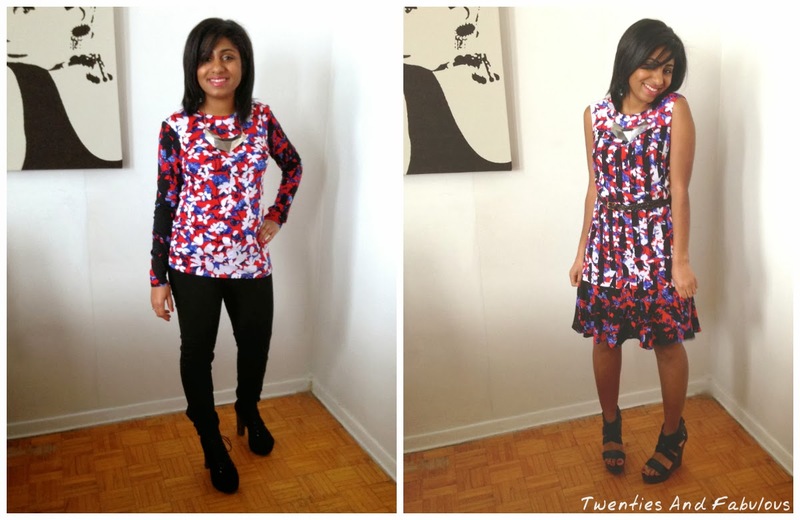 The shirt shown above is basically a take on the floral dress I discussed in my previous post. Just in case you haven't seen it yet you can see it in the picture below. As you can see this dress is really pretty and flirty. As I completely fell in love with this dress and its beautiful floral print, I decided that I had to have more of this lovely pattern in my wardrobe- so I purchased the matching shirt. Plus, the floral print reminds me of spring, which is a great distraction from the bitter weather we are experiencing in Toronto. Although I chose to wear this shirt with pants, it would can also be worn with a nice simple skirt, since the shirt is already quite detailed with print. For instance, a solid black, red or white skirt would look great with this shirt. Remember, the focus is on the shirt because it's already so detailed, so you don't need to overpower it with another busy pattern which can be quite tricky. However, if you choose to go with a solid color at the bottom, but want more of a 'wow' factor, you can always add some funky colorful shoes to make the outfit more fun! I decided to be a bit more simple with a chunky black heel by Jeffrey Campbell which stands out, but also allows the shirt to be more of the focus in this outfit. Overall, I think that this is a great piece and I am happy to add some more print to my wardrobe. I hope you enjoyed this post and got some fashion inspiration. If you liked my post feel free to share with others and don't forget to subscribe!